A LEADING solicitor has told a court that he was the victim of a daylight robbery bid in Edinburgh city centre. Civil law expert Charles McGregor told a jury yesterday police took a long time to respond to the alleged incident, given that it happened around the corner from a police station. Mr McGregor, 48, said a man barged into him and demanded he hand over his wallet outside his office at lunchtime. To Mr McGregor’s horror, his assailant then pulled out a knife and slashed him across the cheek, sending his glasses flying, he said. He told how he grappled with his attacker as blood streamed from a wound near his left eye before the man broke free and walked off. Mr McGregor told a jury at the High Court in Livingston yesterday that he and two female office workers followed the alleged attacker for some time. The lawyer, a partner at global legal firm Clyde & Co, said one of his colleagues called the police as they kept watch on the suspect. 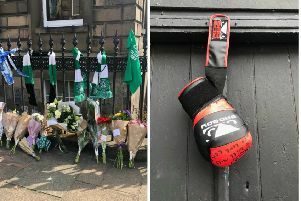 Mr McGregor said they followed the man up Dublin Street to a bus stop on York Place, then back along Albany Street and down Dublin Street before they lost him in Dublin Street Lane. Although they were just around the corner from Police Scotland’s Gayfield Square base, he complained that officers took a long time to arrive. Colette Finnieston, 34, a solicitor with the same firm, told how she took photographs as the alleged attacker boarded a bus in York Place. She said she heard Mr McGregor tell the driver the man had just “mugged” him. All three witnesses identified accused Paul Wright as the man they saw in Albany Street in the city centre that day. Wright, 46, from Stewarton, East Ayrshire, denies assaulting Mr McGregor to his injury and permanent disfigurement and attempting to rob him on April 2, 2015. Police who raided Wright’s home after viewing CCTV from the bus said the accused strongly resembled the man captured on film. They also gave evidence that a jacket and a bus pass they recovered were identical to the items used by the man pictured on the bus.